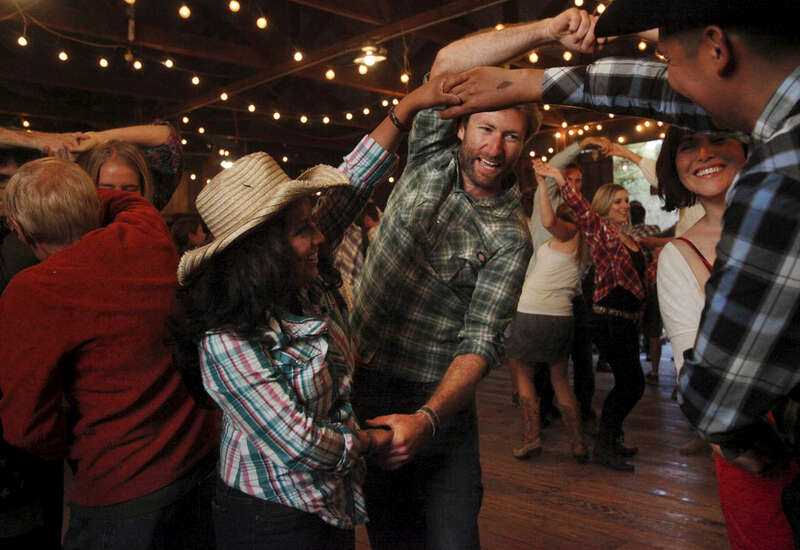 From left, Birza Santiago, 26, Brian Boyce, 30, Stacey Garcia, 31, and Jesus Jocobo, 37, laugh as they do a group dance move together during the monthly barn dance May 17, 2014 at Pie Ranch in Pescadero, Calif. Every month, the educational farm holds a work day and welcomes people to volunteer at the farm. Afterwards, people gather for a potluck and then an evening of traditional barn dancing with a caller and a live band. Margaret More has been attending the dance for eight years, she says she enjoys the intergenerational aspect and added, "it feels like [we've] stepped back 150 years in civilization."